Making the Impossible – Possible! with Ken Ramirez was a fantastic opportunity to learn from a knowledgable and accessible trainer. Ken is the executive vice-president of animal care and training at the Shedd Aquarium. 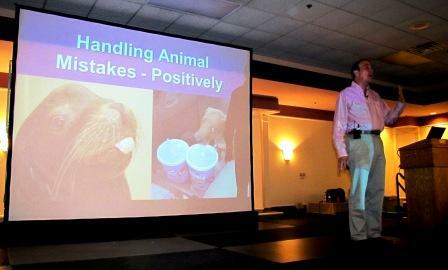 He has written numerous scientific articles and is the author of the book entitled “Animal Training: Successful Animal Management Through Positive Reinforcement”. This 2 day seminar, held in Exton, PA, was chocked full of great information. We discussed reinforcement strategies, handling animal mistakes, concept training, problem solving and the skills of a complete trainer. Ken presented a brief look at his work in mimickry in dogs, a fascinating look at how dogs copy each other. It was great to meet so many wonderful trainers dedicated to using force free methods in training dogs. The contingent from Quebec, Canada was a lot of fun!! !